Las Vegas, January 4, 2016 – More than 1.5 million smart home devices have been affected by the Mirai botnet over the last few months. To help combat this issue, Securifi, makers of the award-winning Almond 3 mesh router with built-in smart hub, today announced the availability of its IoT device security service. Initially available for Almond 3, Securifi’s solution protects connected home devices like DVRs, IP cameras, and smart thermostats from a number of key online threats. Securifi will demonstrate Almond 3’s IoT security features and other Wi-Fi and smart home functionality during CES 2017 (January 5-8) at Sands Expo, Hall B, Securifi Booth #41935. Starting January 23, 2017, all Almond 3 users can sign-up for a 30-day free trial of the subscription-based service. The service will be subsequently rolled out to Almond+, Almond 2015 and Almond (A1A). Pricing will be $3.99 per month for a limited period and will increase to $9.99 per month when additional features are rolled out. Securifi is the first router manufacturer to address the problem of IoT security and provide a solution. Since Almond 3 is the only mesh router on the market today with a built-in home automation hub, it has a holistic view of both Wi-Fi and smart home devices, and can monitor traffic without resorting to dubious techniques like ARP poisoning. “The Mirai DDos attack started with common household network devices like routers, cameras, DVRs, etc., and ended up bringing down the Internet for large parts of the Eastern United States. Manufacturers of such devices aren’t known to pay attention to security. Our new Internet security service, running on Almond routers, protects home networks by identifying problematic devices before they become pawns in Mirai-like botnet attacks. Almond 3 is once again pioneering and redefining what a good home Wi-Fi system can deliver”, said Rammohan Malasani, CEO, Securifi. Feature Overview: Almond 3 uses robust machine learning algorithms to identify devices prone to Mirai-like botnet attacks. 1. 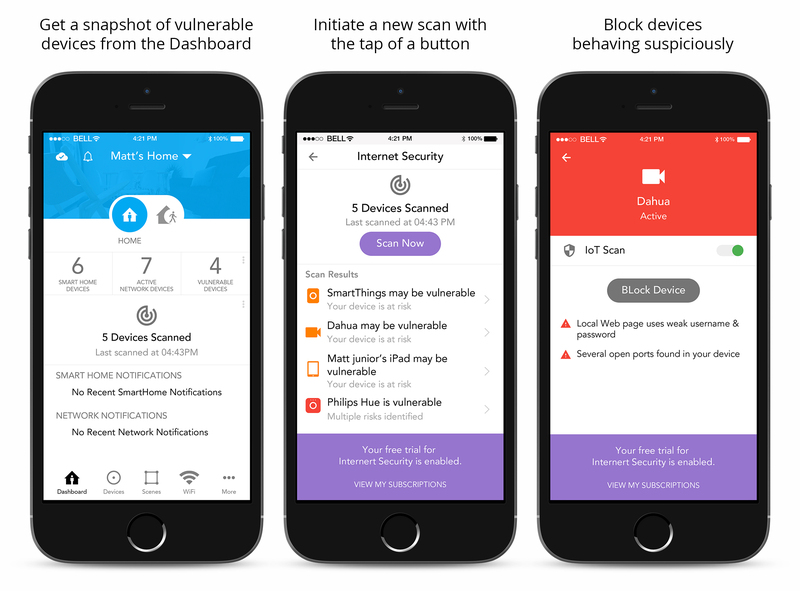 Automatically detect all devices prone to Mirai-like botnet attacks in your network: With this new feature, Almond 3 will scan the network for all devices prone to Mirai-like botnet attacks and send notifications to the user via the Almond App. The user can then choose to block these devices from the network with just a single tap on the Almond App. 2. Flag devices with an unusual traffic pattern: The Almond App will also alert the user if (for example) their Nest thermostat is compromised and is talking to a Russian server. At launch, this functionality will be available for around 20 of the most popular IoT and connected devices, like Nest, Amazon Echo, Wink, Smartthings, Hue, and more. A complete list is available here. Hundreds of devices will be added to this list on an ongoing basis. Almond 3 will only monitor outbound traffic from these devices and will not decrypt any data packets. Like the post office, we’re reading the addresses on the letters and recording these, without opening or reading the letters. 3. Automatically detect zombie devices: Almond 3 will detect if the network is compromised and if some of the devices are acting as zombie devices and participating in DDos attacks. Users will be notified and be able to block these devices from the Almond App. 4. Monitor your kid’s web browsing history and provide guidelines on safe surfing: Almond 3 will keep track of web browsing history for all Wi-Fi devices connected to the network. Parents can then check the types of websites their children visit (e.g. General, PG, Restricted) and talk to them around their surfing behavior. Surveys indicate that a discussion based approach is more successful than blocking access to such websites, outright. This service is purely optional and is turned off by default. 1. Local + Cloud Control: All of Almond’s core functionality runs locally (automation rules, scenes, device control, etc…) The Almond app also supports full local control for both Wi-Fi and smart home devices when a user is connected to the local Wi-Fi network. Remote access to the devices is provided via the cloud. 2. Automatic Firmware Updates Over-the-Air: Almond 3 regularly downloads automatic updates. Users can override this automatic firmware update functionality. 3. Randomized passwords: Almond routers never use default passwords. Passwords are generated using cryptographically safe methods inside the user’s home, and not at our factory or on our servers. 4. Bank-grade encryption: Securifi’s cloud connections are encrypted with 2048 bits. 5. Blocking and Scheduling: The first time a new device joins the network, users will receive a push notification with the device name and the manufacturer information. They can then choose to block devices that they don’t recognize, or choose to receive notifications when new or existing devices join or leave the network. 6. Guest network: Almond 3 supports guest network activation via the Almond app and Alexa voice commands. The solution is designed with users’ concerns around privacy and data collection in mind. Almond 3 will only monitor traffic from the IoT devices, data will not be decrypted and data usage patterns will not be stored. Web browsing history will be stored only for seven days. Users have the option to delete the entire database from our servers at any point of time. Securifi has been redefining next generation consumer routers since 2012. After changing the Wi-Fi game with Almond – the world’s first easy-to-use and attractive router — Securifi is turning the humble home router into a Wi-Fi, security and smarthome platform. Our mission is to create affordable Wi-Fi and smart home products for the masses. Founded in 2011, Securifi has offices in the U.S., Dubai, India, and Taiwan. For more information, please visit www.securifi.com.